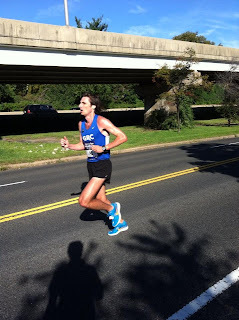 Brian Young took home top honors this morning at the DCRRC National Capitol 20 Miler. Like a zephyr, he swept over the slow terrain of the C & O canal trail with a time of 2:06:30. Although the federal government may be shutting down, the GRC is open for business. On Saturday, nine runners will be hitting the roads of Virigina in the Clarendon Day 5k and 10k, put on by our friends at Pacers Events. In the 5k, Kristie Nunes will race for the first time in nearly two years. 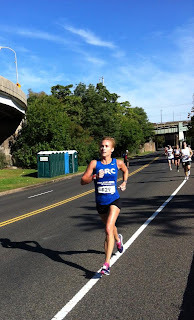 Since tearing her achilles tendon in 2011 during her second race with the team, the former Nittany Lion has marked some significant milestones -- getting married, having a daughter, handing out water at the Father's Day 8k -- but missed out on the reason we have this club: to run and race. She's back, and looking to get after it. 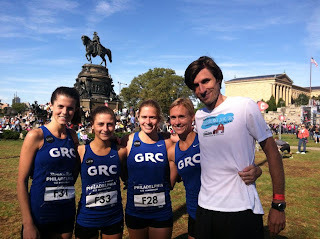 Susan Hendrick will run along side her in the 5k together with GRC first-timers Mary Grace Pellegrini and James Frick. Beth Young (fresh off a 13.1 PR in Philly), Kerry Allen, Sean Barrett, Kieran O'Conner, and Tom Kelly will be sending it on the fast and flat, out-and-back 10k course. I plan to watch the race while doing some easy running tomorrow along the course on Wilson Boulevard so comment if you want to try to link up. On the West Coast, reigning USATF 10k Trail Champion David "Bad Moon" Roche will be making his GRC debut at the Half Moon Bay Half Marathon. As told in this press release, Roche will be running the race with his fiance, whom he will see for the first time since their engagement in August. Says Coach Jerry Alexander, "David has tremendous potential on the roads, and it will be a lot of fun to watch his development." GRC alumnus Patrick Reaves will be running his last race as a single man at Half Moon Bay's marathon. 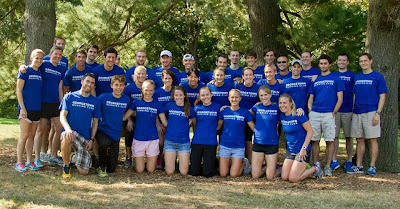 In Pittsburgh, Western Pennsylvania natives Charlie Ban and Maura Carroll habitual visitor Sam Luff, plan to drop their competitiors like they drop their "ing's" during the Great Race 10k. All three ran well at this race last year and are looking to do somethin' special on Sunday. Closer to home, Kevin McNab (aka "Johnny Running"), an All-American steeplechaser at Texas A&M, will take to the streets of Baltimore for the Run for Kids 10k. This course appears to be tough, but Alexander thinks that "Kevin is in great shape, and he will be a force to be reckoned with this fall." The Army Ten Miler is just 24 days away. Get excited! 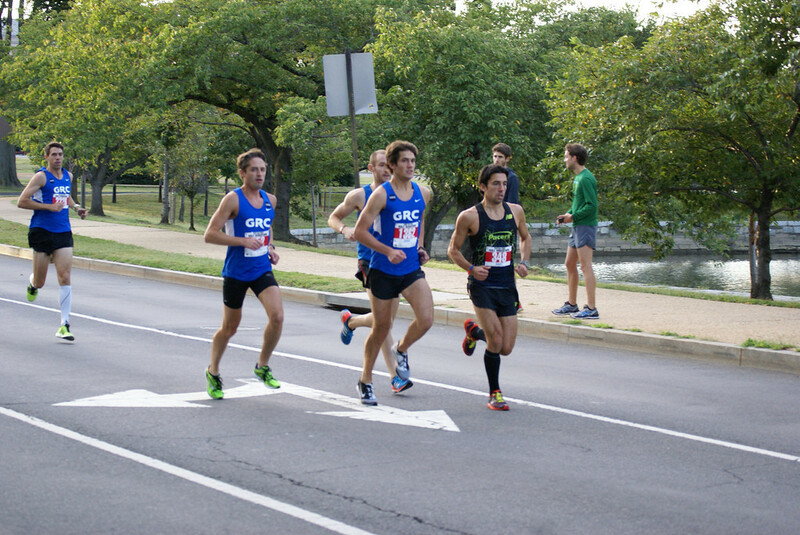 Mike "Risky Business" Franklin, running for the first time in a GRC singlet, won the Navy 5 Miler this morning in Washington, D.C. with a time of 24:52. Meanwhile, Hilary May bested all females with a winning time of 30:12. Both set event records. Sam Luff finished 3rd in 25:28 while Ryan Witters and Paul Guevara finished 4th and 5th, at 25:43. Dave Wertz and Charlie Ban ran 26:23 and 27:40. A few GRC athletes were left behind when the gun went off 10 minutes earlier than advertised. Kieran O'Connor and Paul Balmer missed the start of the race, but ran 25:14 and 25:50. Maura Carroll also started almost two minutes late. She finished fourth in 31:49, though she covered the course in 29:57. 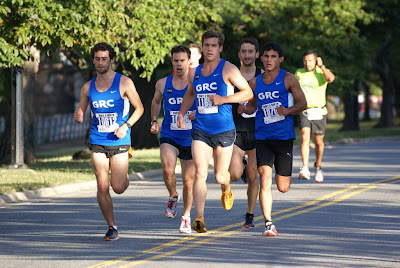 In the half marathon, Evan Jurkovich (1:10:00), Dave Burnham (1:10:03) and Matt Hassett (1:10:07) finished 3rd, 4th and 5th, all averaging a tick or two above 5:20 mile pace. Hassett PR'd by almost 3 minutes - a major breakthrough for sure. Patrick Murphy tempo'd a 1:16:58, Brian Young ran 1:19:26 and Scott Koonce ran 1:21:46. 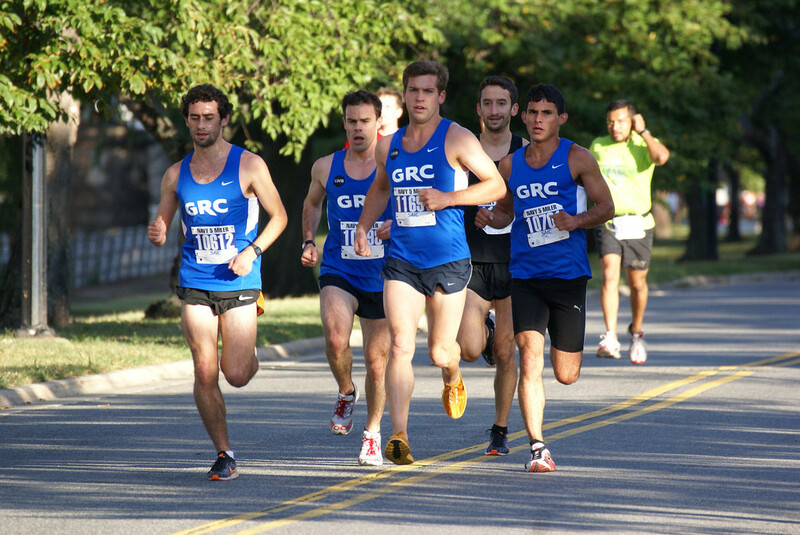 Although autumn won't officially start until September 22, the Georgetown Running Club's fall season will begin in earnest this weekend. After a long summer of build-up and workouts, the GRC will finally race in Philadelphia and Washington, D.C. In downtown Washington, David Burnham aims to defend his title at the Navy-Air Force Half Marathon. Last year, the Dartmouth graduate won the race with a time of 1:10:10, nearly 3 minutes ahead of the next closest competitor, GRC's Matt Hassett. "(Burnham) better keep an eye out for young Hassett, who is very fit, and looking to move up to the top step of the podium this year," said GRC Coach Jerry Alexander. "If I were a betting man, I'd call this one even money." Also running in 2013's edition of the race is Dave O'Hara, who underwent surgery on a pair of hernias in June as well as all around good guy Brian "Breezy" Young. 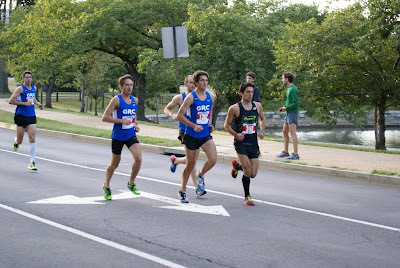 In addition, a handful of GRCers will be racing Navy's 5 Miler, including Michael Franklin, who will be making his debut in the blue and white singlet. Last spring, Franklin turned heads after he won both the 5,000m and 10,000m at the Heptagonal Outdoor Track & Field Championships. "I'm really excited for Michael Franklin's GRC debut, said Coach Alexander. "Mike is a superb talent who will continue his meteoric rise in a GRC singlet. Mike has already made his presence known in workouts, and having him around has already made the other guys better." Middle-distance specialist Ryan Witters will also be racing on Saturday. Like Franklin, "Witty" has the potential to better the course record of 25:13. GRC Runner of the Year (2011 and 2012) Sam Luff will race for the first time this fall after a nagging injury precluded him from training earlier in the summer. He's now healthy and hopes to return to the racing scene with gusto. Also racing Saturday's 5 miler will be Brian Faherty, Paul Balmer, "Texas" Paul Guevara and Charlie Ban. Hilary May and Maura Carroll will represent the women in the 5 miler. On Sunday, a trio of women will descend on the City of Brotherly Love to race in one of the most ballyhooed half marathons around - the Rock n' Roll Philadelphia Half Marathon. "If the weather cooperates, we could see some big PRs in Philly," boasted Coach Alexander. Distance runners Beth Young, Kerry Allen and Julie Tarallo, who all ran marathons this past spring, will aim for personal bests this weekend. Said Coach Alexander, "Beth is in the best shape of her life, and she's looking to have a breakthrough in the half commensurate with her huge marathon breakthrough in Eugene in the spring. Kerry and Julie also look great, and are ready to build on their success in the spring." Catherine Campbell, who recently left the Washington-area to pursue an education in dentistry, will run her last race in a GRC singlet. Sean Barrett, a Captain in the United States Marine Corps, and Dickson Mercer, a speechwriter for the Department of Transportation, will also lace up their flats for the half. 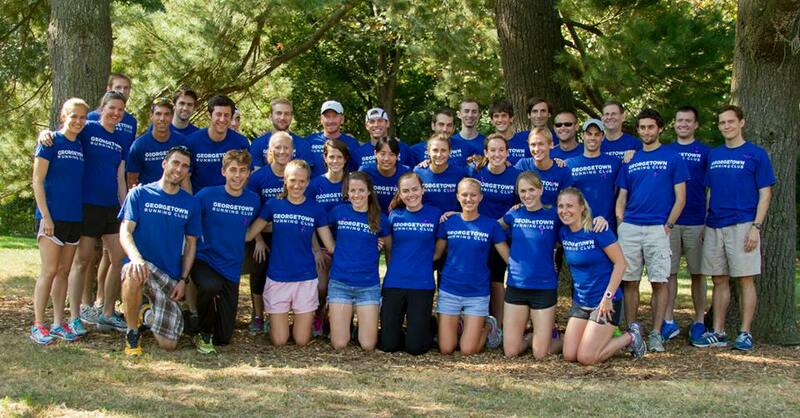 Later this fall, Mercer will head out west to contest the Twin Cities Marathon. "Sean has been training extremely well, and if all goes well, he will be ready to challenge his personal best," said Alexander. "Dix will be running his final tuneup of the US Marathon Championships in 3 weeks, and he's ready to run PRs in both the half and the full." It will undoubtedly be a big weekend for the GRC. Stay tuned to the GRC blog, GRC Twitter handle and/or the GRC Facebook page for breaking news updates. The new smash hit of summer.